Invacare's Aero-Tech Uno wheelchair cushion is able to provide a high level of skin protection through the novel use of its air cushion. 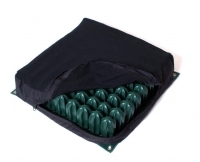 Endlessly adjustable through the use of a traditional single air valve, the wheelchair cushion is made up of air cells that are interconnected. These cells allow free flow of air under loading pressure that in turn provides excellent pressure redistribution, and move with the user reducing shear forces. The continual movement of the air in the cells provides protection for the ischial tuberosities and coccyx area (sitting and tail bone area).